The Klokov barbell is named after an athlete known as Dmitry Klokov, who showed great significance and excellence on stage. With that, it’s expected that his named barbell also play a huge roll with respect to its manufacturing, design and packaging. The Klokov barbells are constructed by engineers having an experience of thirty years along with Dmitry Klokov, an Olympic weightlifter who has an experience of twenty years on this field. The Klokov equipment are designed in such a way to meet users’ demand and construct a design by which they are fully satisfied with. With the rise of Weightlifting competitions, like CrossFit and Olympic weightlifting in a very gold age, the weightlifting is not considered as a side sport from there. As the time passes there is also a need to innovate our equipment in a best possible way, to make this sport playable in a best possible way. One of Klokov great innovation which is crafted with the help of finest engineers and Dmitry Klokov is theKlokov Olympic Weightlifting Barbell. This barbell is a competition bar that meets all IWF and IPF standard and dimensions, to provide the same feel and performance in a weightlifting competition. The bar is constructed with solid steel, and provides greater strength and durability with a tensile strength of 235,000 PSI. The collar bearing and bushing design provides a smooth and comfortable spin. 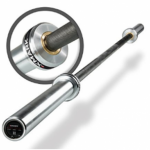 The knurling is very much customized that lets you grip the surface of the barbell with excessive power. The bar comes with center knurling which is a bit of passive. The collar is constructed with ten needle bearings to provide a repetitive motion and spin. The bar comes with a weight of 20kg and has the ability to withstand weight up to 680 kg. Though there is a slight difference of weight tolerance in a range from 20 grams to 10 grams, above or below the specified weight. The bar comes with a ten year warranty in which every manufacturer part is included. The Klokov Olympic weightlifting barbell fulfils all IWF and IPF standards and dimensions along with knurl mark spacing that plays a key role in weightlifting competitions. The bar is constructed with solid steel having a massive tensile strength of 235,000 PSI. 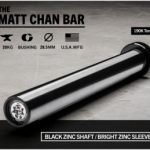 With a weight of 20kg the bar has been made capable enough to withstand weight up to 680 kg. The bar consist of a hard chrome finish and stain luster that prevents the bar from getting rust and corrosion. Chrome is considered one of the expensive material due to immensely well durability and less oxidation rate in humid regions. One of the most attractive thing you will see on the barbell is the attention and detail by which this Klokov barbell is constructed. The serial number and name of the barbell is permanently etched on the barbell along with Dmitry Klokov signature, which shows it’s a genuine piece of equipment and you are doing your investment in a correct direction. With color coded end cap badge, makes the barbell more eye warming and appealing towards many athletes. The knurling on the bar is moderate which makes the bar very comfortable to lift heavy weights. You can even customize Klokov center knurling by making it more rough or aggressive, to come up with a more secure grip. 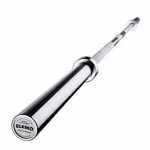 The barbell comes with a center knurl which is very effective at the time of re-racking the barbell after doing exercises such as push press or jerks. The center knurl is also very effective while doing triceps and for experienced powerlifters who uses low bar position while doing squat. Around ten needle bearings are encased under the stainless steel ring. The barbell also comes with bushing which provides maximum durability. It is very rare to find bearing and bushings both in a barbell, Klokov done this because Dmitry knew that the spin of the barbell is everything and one of the most major factor on which most of the barbells usually lack. Having a bad spin will not make that suitable for heavy snatches and clean. On each sleeve, five needle bearings are set up to allow the barbell spin freely and repetitively. Thus, providing a quick, smooth and comfortable grip and spin for weightlifters, while doing CrossFit and Olympic weightlifting. The bar comes with a slight weight tolerance from twenty grams to ten above or below the specified weight. The bar has a total length of 2200mm. On which the diameter of the shaft is kept is very standard that is 28mm. This diameter has the capability to fit every standardized Olympic weight plate. Proving Klokov Olympic barbells durability much further, it is backed with ten years limited warranty which is very hard to find in today’s Olympic barbells. The bar comes with a tensile strength of 235,000 PSI. 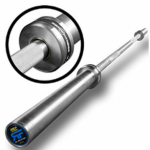 The knurling on the barbell is done with respect to IWF marks in which center knurl is also provided. The knurling is pretty much moderate and passive center knurl. The bar is constructed with ten needle bearings and bushings. Consist a weight tolerance of twenty grams to ten grams, above or below the specified weight. A massive length of 2200 mm and a standard shaft diameter of 28mm. The bar have a weight of 20kg and can withstand weight up to 680 kg. Comes with a ten year manufacturer warranty. In my opinion, the Klokov Olympic Weightlifting Barbell by Dmitry Klokov and team, is one of the best barbell to workout with if you are a professional weightlifter and high level athlete. The bar is designed and constructed to meet Olympic weightlifting competitions. 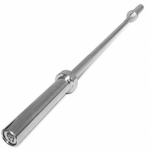 As being a professional weightlifter, I decided to purchase this barbell. The barbell was very expensive but looking its features and specifications, I wasn’t able to resist it. The bar came in a good packaging and was arrived at my doorstep within four days of my purchase. When I opened the box, I found that the barbell is in very good shape, while the hard chrome and satin luster finish looked very genuine and eye-warming. Seeing its impressive design I wasn’t able to resist myself from doing my first workout and after doing a set of bench press along with cleans, believe me this was the best barbell I ever used. From knurl to lift, the bar was very comfortable, the spin of the bar was really impressive due to needle bearings while the bushing provided great comfortability respectively. The bar was very whipper which made me to perform high intensity workout with ease. 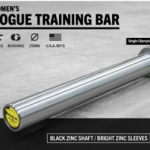 Overall, this barbell is one of the best investment you will ever do on fitness equipment and it is fully recommended to everyone out there. Comes with a massive tensile strength of 235K PSI which can handle weight up to 1500 pounds. The knurling done on the barbell is perfect which sticks to your hands very firmly. The whip and spin of the bar is very smooth, while the knurling doesn’t damages yours hand. 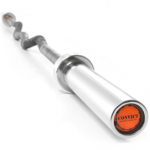 Center knurl is very passive and helps a lot on re-racking the barbell and while performing squats and cleans. The hard chrome finish helps the bar from getting rust and corrosion while having a less oxidation rate in humid regions. The barbell is very expensive. Needle bearing should be handled with care.